Crowne Plaza Manila Galleria welcomes Chef Peter Yeung, a modern Cantonese expert to lead the kitchen of one of the metro’s renowned Chinese restaurant, Xin Tian Di. Chef Peter, a Hong Kong Chinese national have been perfecting his craft in the Philippines for the past 20 years. From his noble beginnings as Cook and Assistant Chef in various restaurants in Hong Kong, he moved to the country in 1995 and joined Subic Legend Resorts and Casinos as Chinese Chef. He had also been with Jade Palace Restaurant prior to embarking in hotel restaurants including Manila Pavilion Hotel, Sofitel Philippine Plaza, and Radisson Blu as Chinese Chef. His fondness of working with Filipinos convinced him to stay and continue to work in the country. “I enjoy working with Filipinos…they are happy people,” he shares. The enthusiastic Chef from Hong Kong is also a health buff and a fan of fusion cuisines. He says preparing healthy cuisines is a personal advocacy as he cares for the people who eat his food. One of his specialty dish is a “steamed king prawns with wolf-berry and garlic in violet rice” – a perfect source of protein and mineral substance, which also prevents high blood pressure. He complements his dishes with healthier options of ingredients. Chef Peter also loves to try different flavors from various cuisines particularly Japanese, Mediterranean, and Italian, and incorporate them to Cantonese dishes. “I want to learn and do things differently everyday. I don’t want to limit myself and be boxed because there a lot of opportunities to be better,” says the Chef. This Christmas, Chef Peter prepares an opulent feast for family and friends dining in on December 24 and 31 (dinner), December 25 and January 1 (lunch). 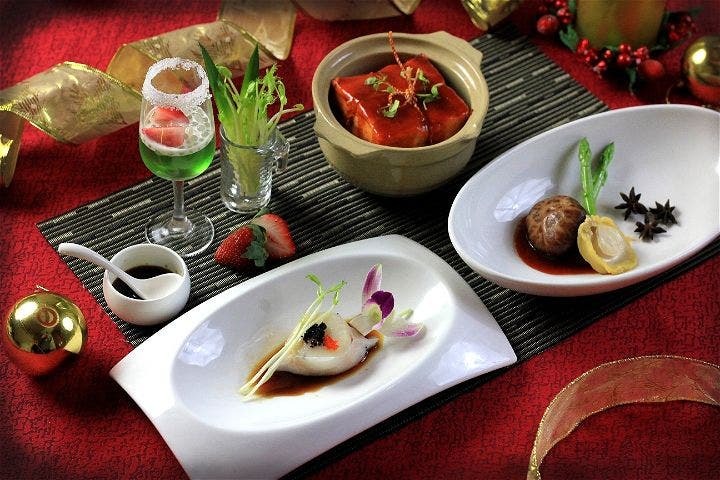 Set Menus include stew abalone with flower mushroom and pan-fried Christmas turkey Jiao Zi, and are available for 4-10 persons. Sample Chef Peter’s modern Cantonese dishes and healthy options at Xin Tian Di. For inquiries and reservations, please call 633-7222 or email fandb.reservations@­ihg.com.